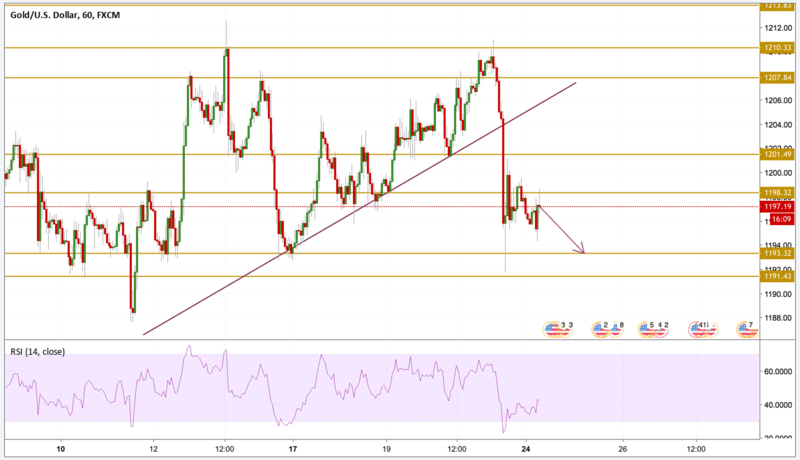 Gold took a big hit during Friday's session as investors take sides ahead of the FOMC meeting this week in light of a strong US economy and figures. The Dollar is regaining its strength after the Chinese have refused to attend trade talks that were scheduled for this week and that risks retaliation from the White House that may impose tariffs across the remaining Chinese imports. Gold prices broke the trend line shown on the chart to the downside breaking all support levels all the way until reaching the $1192 level. The price is currently still hovering below the $1200 level with a neutral bias. We expect the price to rest a bit in the current zone before retesting the lows so we will be focusing on $1193.3 support level.